SYNTHESIS HUB is an ideal house of publications that accepts and promotes a creative research across the globe without any reservations over religion, nationality, boundaries. It serves as a vehicle of research and education between the modern youth and the experienced, competent and qualified professionals through their intellectual awakening. It invites better than the best in all branches of knowledge such as English, Management, Biological Sciences, Social sciences, Arts & Education, Pharmacy, Mathematics, Physical Sciences and Engineering & Technology. SYNTHESIS HUB publications strive to become a fillip between the upcoming professionals, entrepreneurs, managers, administrators, scientists, technocrats, engineers etc. It will provide a Strong platform for all those who wish to contribute their potentialities of knowledge to all peoples and all nations. Our journals would be an asset to any institution's library. The quality of the people who freely give their time and effort to the journals, as editors, editorial board members and contributors, bears witness to the high esteem the journals are held in, in many circles. Of course, all content is fully refereed. The journals are well-established, properly organized and meet researchers' needs. 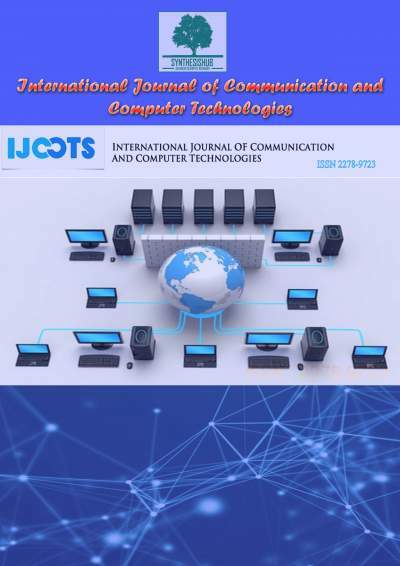 Copyright © 2019 International Journal of Communication and Computer Technologies All Rights Reserved. Subject to change without notice from or liability to International Journal of Communication and Computer Technologies.